Viruses are the smallest of all the microbes. They are said to be so small that 500 million rhinoviruses (which cause the common cold) could fit on to the head of a pin. They are unique because they are only alive and able to multiply inside the cells of other living things. The cell they multiply in is called the host cell. 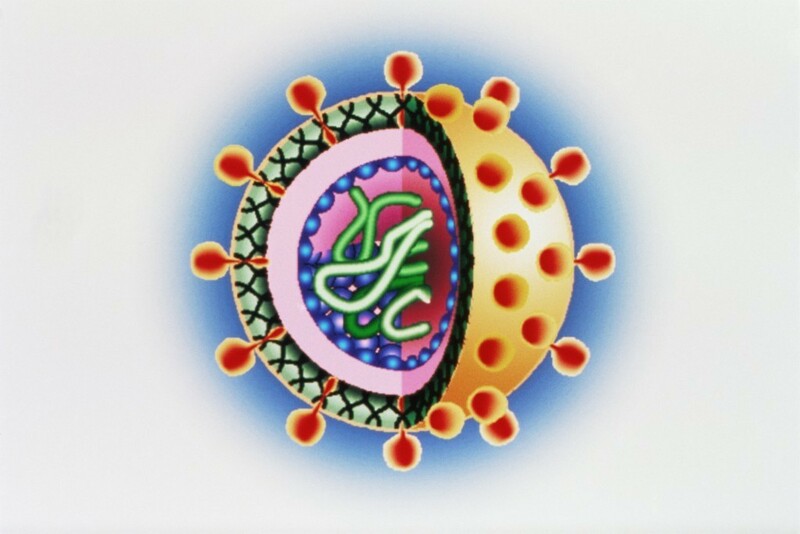 A virus is made up of a core of genetic material, either DNA or RNA, surrounded by a protective coat called a capsid which is made up of protein. Sometimes the capsid is surrounded by an additional spikey coat called the envelope. Viruses are capable of latching onto host cells and getting inside them. Computer artwork of a typical virus particle which is icosahedral in shape. The virus consists of a core of RNA (ribonucleic acid, green) enclosed in a capsid, or protein coat (blue spheres). Surrounding the capsid is a glycoprotein envelope (pink and green). Inserted in the envelope are surface proteins (orange spheres), which help the virus attach to its host cell. 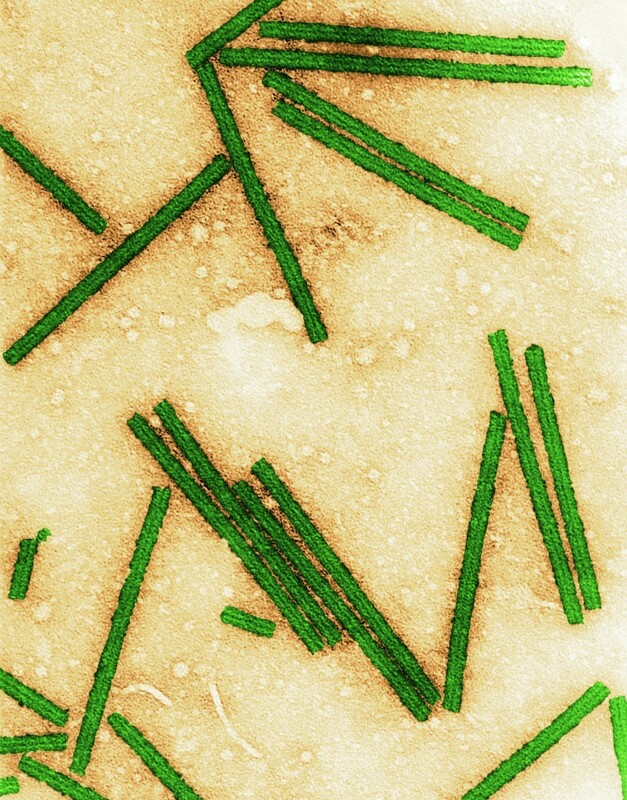 Tobacco mosaic virus which is helical in shape. 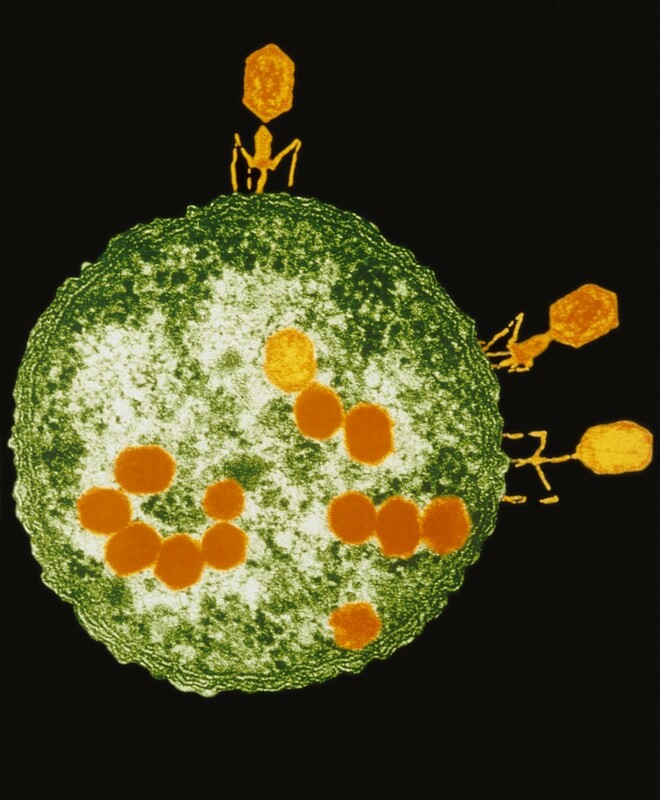 T2 bacteriophage viruses (orange) attacking an Escherichia coli bacterium. Each phage consists of a large DNA- containing head and a tail composed of a tube-like central sheath with several fibres. 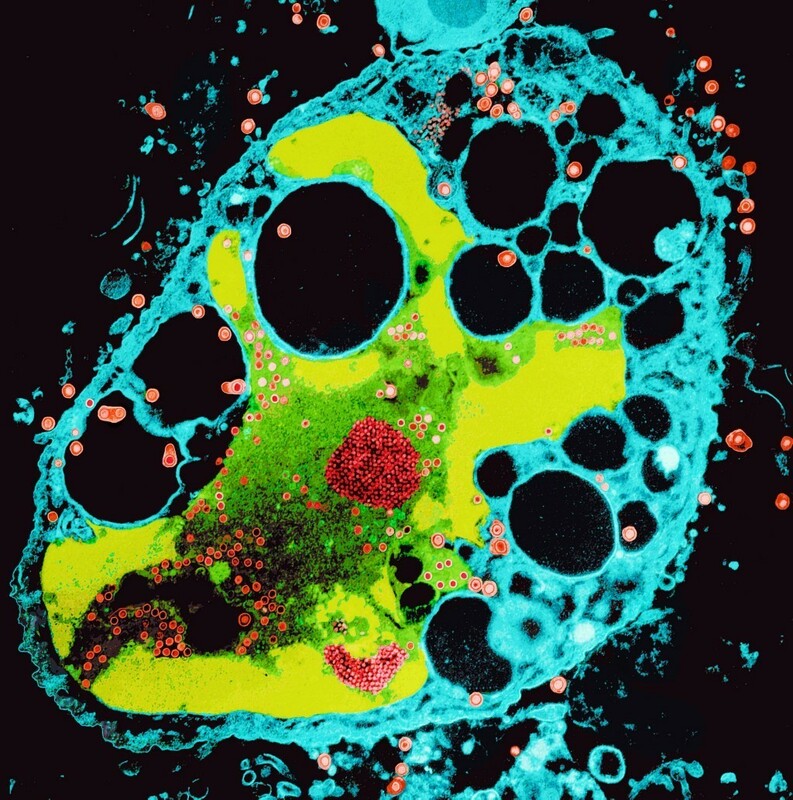 AIDS virus (red/green) budding from the surface of a white blood cell. A section through a cell being destroyed by herpes simplex virus infection. At centre is a large cluster of viral capsids (protein coats, red) which the cell has produced at the direction of the virus's genetic material. Viruses only exist to make more viruses. 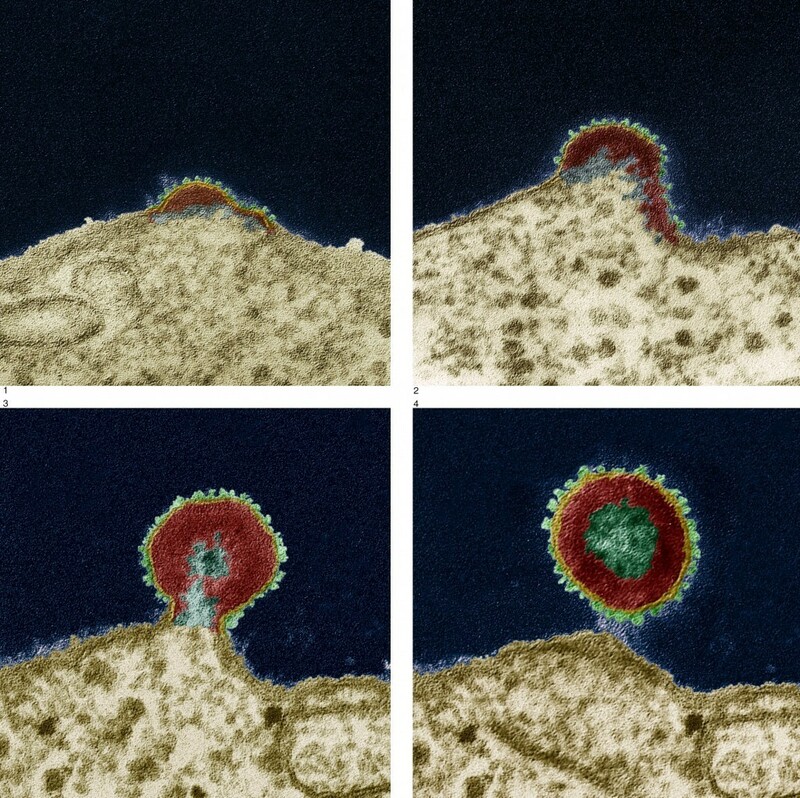 The virus particle attaches to the host cell before penetrating it. The virus then uses the host cell’s machinery to replicate its own genetic material. Once replication has been completed the virus particles leave the host by either budding or bursting out of the cell (lysis). As the newly formed viral particle pushes against the host cell’s plasma membrane a portion adheres to it. The plasma membrane envelops the virus and becomes the viral envelope. The virus is released from the cell. This process slowly uses up the host’s cell membrane and usually leads to cell death. The virus particles burst out of the host cell into the extracellular space resulting in the death of the host cell. Once the virus has escaped from the host cell it is ready to enter a new cell and multiply.